Blog What Is Wick System Hydroponics? In the world of hydroponics, wick system hydroponics is definitely the simplest and easiest in both form and function. As you will see, these systems only require four components, and you can readily build a functioning system out of everyday household items, for those of you who are fans of reuse and upcycling. The trickiest part is probably choosing what to use for your wicks, and that’s just because there are so many materials to choose from. Wick system hydroponics is the simplest of the six types of hydroponics system designs. The name refers to the fact that these systems take advantage of the action of wicking to feed a water-based nutrient solution to the roots of plants. The growing container is positioned a short distance above the reservoir, and wicks are placed so they will draw the nutrient solution up from the reservoir and release it into to the growing medium, which in turn, absorbs it and makes it available to the plant roots. And that’s it. Elementary, my dear Watson! How Does Wick System Hydroponics Work? In a hydroponic wick system, capillary action is what feeds the nutrient solution to the root zone of the plants. Capillary action is the mechanism by which sponges and paper towels draw up liquid from a surface. If you’ve ever gotten up from a park bench or outdoor patio chair and discovered that your backside is wet, well, you’ve been a victim of capillary action at work by your clothes. It’s also how a candle wick draws wax or an oil lamp wick draws its fuel up to where the flame is – which is why we also have the term “wicking” to describe the same phenomenon. Wick system hydroponics is a passive form of hydroponics, meaning the system works without the need for any motors, pumps, or moving parts. This doesn’t dictate that you can’t utilize any kind of machines, though. Rather, it just describes the basic functioning of the system. In fact, these simplest of all the hydroponics systems often include a pump to aerate the nutrient solution, but it’s not required for the system to work. The capillary action delivers the liquid to the roots all by itself. Why Choose Wick System Hydroponics? One of the main reasons for choosing wick system hydroponics is because it’s the most environmentally friendly hydroponics system. If located in a place where your plants will receive plenty of natural light, you don’t need any electricity to grow plants. You can choose to use recycled and renewable materials for all of your system components. And hydroponic wick systems consume less water and nutrients than the others. The other main reason people choose wick system hydroponics is its elegant simplicity. It makes for an excellent beginner project for anyone who is just starting out with hydroponics. You can design a setup that’s very rudimentary, and the system is relatively maintenance-free – you’ll just need to refill the nutrient solution reservoir as needed and flush the system regularly. With wick system hydroponics, you don’t need any kind of specialized equipment. For a super simple system, you can use a couple of buckets for your containers. Or, there’s a cool way to make a mini wick system planter out of a 2-liter plastic bottle. As for the wicks, any material that is absorbent will work: string, rope, yarn, or even cut up strips of old clothes. You likewise don’t need much specialized knowledge to be successful with wick system hydroponics – and what you do need to know you can learn right here! What Plants Are Wick System Hydroponics Best Suited For? These systems are best suited for cultivating smaller, non-fruiting plants, such as herbs and lettuce. They’re also great for starting seeds and cuttings. The reason is that wicking is a relatively slow, low-volume way to move liquid, and these types of plants don’t need much in comparison to other types. Hydroponic wick systems are often used in complement with other growing systems that can support higher volumes of plant growth. 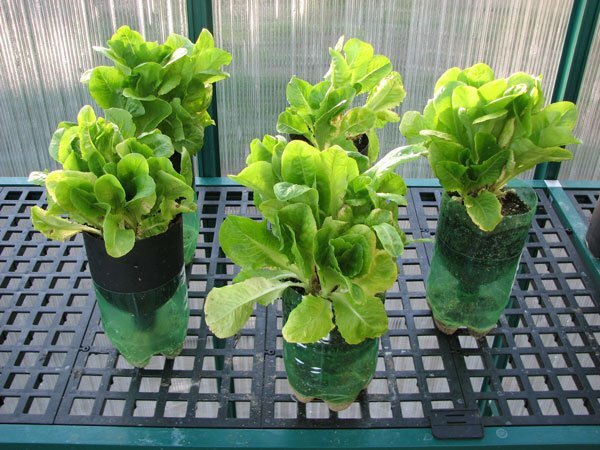 They are popular as wintertime lettuce and herb gardens. And they can be used year-round for starting plants that will be grown elsewhere. How Do I Build A Hydroponic Wick System? To build a hydroponic wick system, all you need are the four components listed above.In this section, we will walk through each of these fundamental components. This could be anything from a regular bucket or plastic tub to a custom-built grow tray. It will contain the plants and the growing medium, which can be either situated all together in the growing container or separated into individual containers. You will need to make small slits or holes in the bottom of your container for the wicks to pass through. When designing this portion of your system, keep in mind that you will need to periodically flush out the growing medium, so you’ll want to make sure you’ve set your growing container up so you can do this easily. To discourage algae and other microbes, your reservoir should be a container that doesn’t pass light, although it doesn’t need a cover, since the wicks will be dangling down into it from the growing container above. The reservoir should be located as close to the growing container as possible so the wicks can deliver the solution to the growing medium most efficiently. You will be topping up the solution regularly as well as completely cleaning it out once in a while, so it’s best to situate your reservoir so it’s not difficult to access. You can install an aquarium pump and/or air stone to aerate the nutrient solution and help ensure that the plant roots are maximally oxygenated, although it’s not a must. The additional oxygen in the liquid will encourage the roots to take up more nutrients and enable your plants to grow faster. For wick system hydroponics, it’s essential to use a growing medium that absorbs and holds moisture well, as this is where the plants get all their water and nutrients from.The most popular growing media for wick systems are coco coir chips, perlite, and vermiculite, as their lightweight structure wicks up water well and will keep the root zone moist while also providing roots with plenty of oxygen. Growstones are another good option, since they have excellent wicking capacity. As with any hydroponics system, you want the plants to have plenty of moisture, but you need to make sure they’re getting a good supply of oxygen, as well. To learn all about the different growing media for hydroponics systems, click the link to read my article. Wicks can be in the form of string, yarn, rope, or strips fabric. The material can be anything from cotton, wool, and felt, to nylon, polyurethane, and other synthetics. Popular items used for wicks include tiki torch wicks, microfiber cloths, terrycloth towels, and strips of felt.You may want to experiment with different options to determine what works best with the growing medium you are using before you begin growing your plants. Also, washing the material well before use may improve its wicking power. While you can make wicks out of just about any absorbent material, it’s better to use something that’s durable and resistant to rotting, if you are planning for long-term use of your system. One of the best things you can use is fiberglass wicking that comes in rolls or spools and is meant for oil lamps and candle making, although gardening centers sometimes carry it. The number of wicks you use will depend on the design of your system, the growing medium you use, the number plants you are growing, and the types of plants they are. However, as a general rule, unless your setup is a small one, you should plan on using at least two wicks per plant. What Are The Advantages Of Wick System Hydroponics? The main advantages of wick system hydroponics are that it’s simple to build and easy to maintain.Whether you choose to keep it small or scale it up, you can do it by recycling or upcycling common household items and materials. And once you have it up and running, you can enjoy low-maintenance gardening year round. Another major advantage is that it doesn’t require electricity. This makes it possible to set up a hydroponic wick system in places that lack access to electric power as well as making it all the more sustainable by not consuming electricity for artificial lighting. Speaking of sustainability, wick system hydroponics is very water efficient. The system is self-regulating, since the delivery of the water-based solution is dependent on the consumption of the solution by the plants, themselves. Furthermore, hydroponic wick systems use less water and nutrients than other growing systems, due to the types of plants it supports. What Are The Disadvantages Of Wick System Hydroponics? There is one pretty big downside to wick system hydroponics: You are rather limited in what plants you can grow, due to the slow rate at which the nutrient solution is delivered. Plants that are larger and those that produce fruits are thirstier for water as well as nutrients to support their growth and are therefore not well suited for these growing systems. Another disadvantage to wick system hydroponics is that the growing medium is susceptible to toxic buildup of nutrients over time. However, by rinsing it out every week or two with fresh water, this problem can easily be avoided. How Do I Monitor And Adjust A Wick System To Keep Plants Healthy? Although wick system hydroponics is a low-maintenance system, there are still a few things you should do to make sure your plants are healthy and happy in their growing environment. 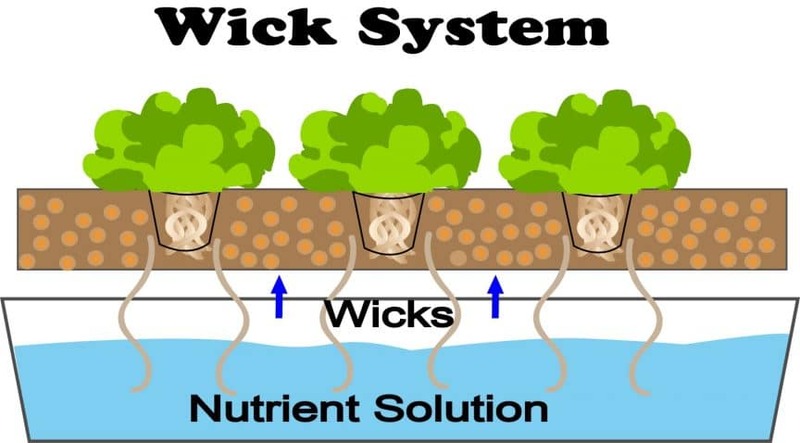 The biggest concern in hydroponic wick systems is that the plants are not receiving a sufficient amount of nutrient solution, due to the low volume at which the liquid is delivered by the wicks. So you should regularly check that the medium is remaining consistently moist and watch out for plants that are showing signs of thirst. Be aware that drier air, higher temperatures, and larger plants will require more moisture. In case of dryness, you can add more wicks, try a different type of wick material, or switch out your growing medium to something that is more absorbent. To help ensure that your plants are regularly getting enough water, keep the solution level in the reservoir topped up, rather than only refilling the nutrient solution when the level gets low, so the liquid doesn’t have as far to travel up the wick. Despite a lowered concern about overwatering, you should still watch out for this, as it would mean your plants are not getting enough oxygen. Make sure the growing medium isn’t soggy, and look out for mold or mildew, in addition to inspecting your plants for any of the danger signs listed below. To correct this problem, you can try using an aquarium pump to aerate the nutrient solution, or switch out your growing medium to a type that allows the roots better access to oxygen. And finally, be sure to thoroughly rinse your growing medium with fresh water every couple of weeks or so to prevent the buildup of nutrients from harming your plants. Any of the signs listed below could mean the plants are suffering from fertilizer toxicity.You can save them by immediately flushing the growing medium, and then do this more frequently as you move forward. If you’re not sure whether wick system hydroponics is the right choice for you, I’ve written an article explaining all about the main types of hydroponics systems. Hydroponic gardening can be as simple or as complicated as you want it to be, but is a great hobby to get into. I’ve certainly found it to be hugely rewarding using hydroponics both indoors and outside to grow a variety of fruit and vegetables that I can enjoy all year round.